Download this white paper to learn more about how to leverage strategic planning and industry best practices for a virtually pain-free Windows 7 migration. This high-level, strategic white paper addresses business, solution, and product specifics that should be considered when architecting, planning and preparing for enterprise Windows 7 or virtual migration. It also provides best practices on how to approach the application migration problem, and how to avoid this problem for future migrations. 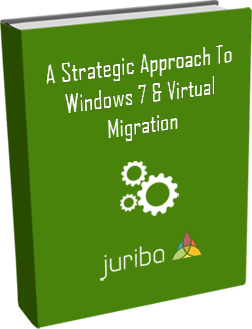 Juriba has gained in the past 10 years extensive IT transformation experience helping hundreds of organizations ready more than 7 million assets for migration using its data warehousing and IT project management tool, Dashworks. Learn how to best plan your enterprise Windows 7 migration by requesting your free white paper by filling out the form to the right and providing a valid work email address!